Capacitive Touch Sensing with Bare Conductive « Adafruit Industries – Makers, hackers, artists, designers and engineers! This is a short article demonstrating an experiment with Bare conductive ink and the MSP430’s capacitive sensing hardware. An alternate method is available on several of the MSP430 value line microcontrollers (G2xx2, G2xx3, FR58xx, FR59xx). In addition to the typical pin peripheral functions, they include a relaxation oscillator circuit that includes pin capacitance to set the frequency. By measuring the number of oscillations in a given time period, a small change in capacitance can be measured…enough to detect whether a finger is touching an electrode. 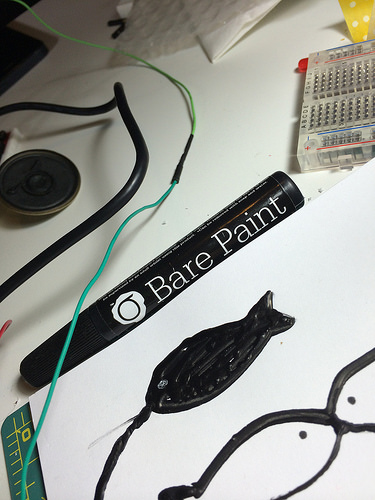 Bare Conductive Paint Pen – 10mL – Bare Conductive Paint is a multipurpose electrically conductive material perfect for all of your DIY projects! Bare Paint is water based, nontoxic and dries at room temperature. Bare Paint is the first non-toxic electrically conductive paint available to consumers today. This unique child-friendly material is designed for people of all ages to explore and learn about electronics with an inclusive, easy-to-use material. Bare Paint provides a dramatically different method of interacting with electronics as it can be applied to almost any surface, including cardboard, paper, wood, wallpaper, walls, textiles, and some plastics. Bare paint can be used to replace conventional acid etching, making it a great electronics prototyping tool. Nontoxic and water-soluble, Bare Paint can be used without gloves or mask. The paint dries quickly at room temperature, and can be removed with soap and water. This means it’s also not water-proof or weather-resistant! Application Methods Include: painting, screen printing & spray painting among others. Despite being called “Bare” conductive, it’s meant not for use on bare skin.